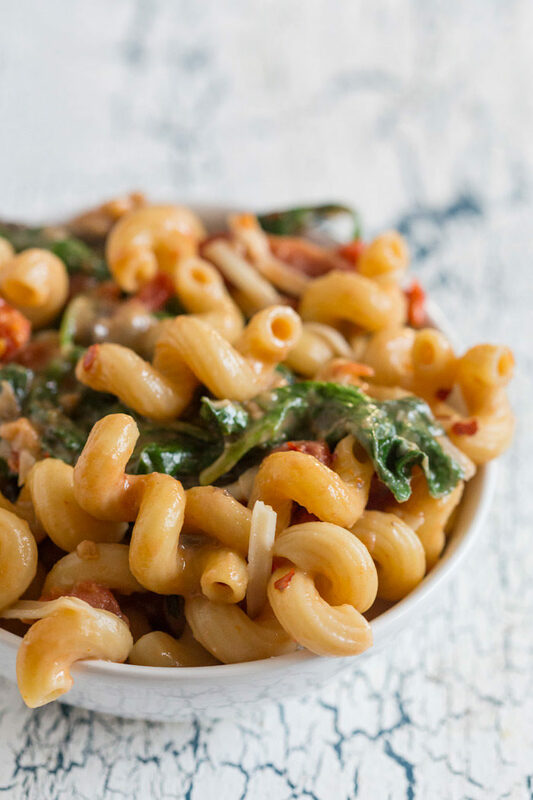 This creamy pasta is loaded up with spinach, tomatoes, and Asiago cheese. Just 20 minutes from cutting board to table – and only one pot to clean! Winner winner pasta dinner (with chicken option)! 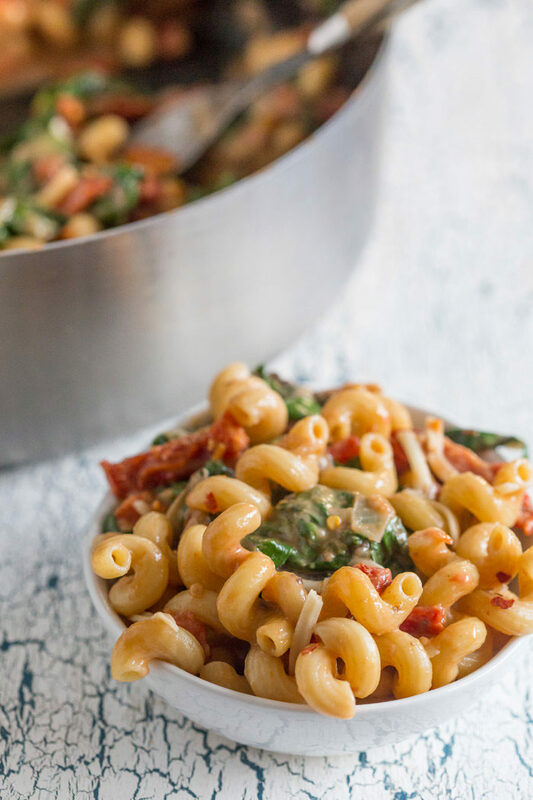 Note from Kare: Brandy from Nutmeg Nanny is back with this easy (truly) cheesy (absolutely) dinner that’s not only on your plate in 20 minutes flat, but it’s dang tasty too. Brandy’s one-pot pasta method is a bit different than mine, in that hers is way more hands-off, so it’s even easier. Gotta love it. Take it away Brandy! 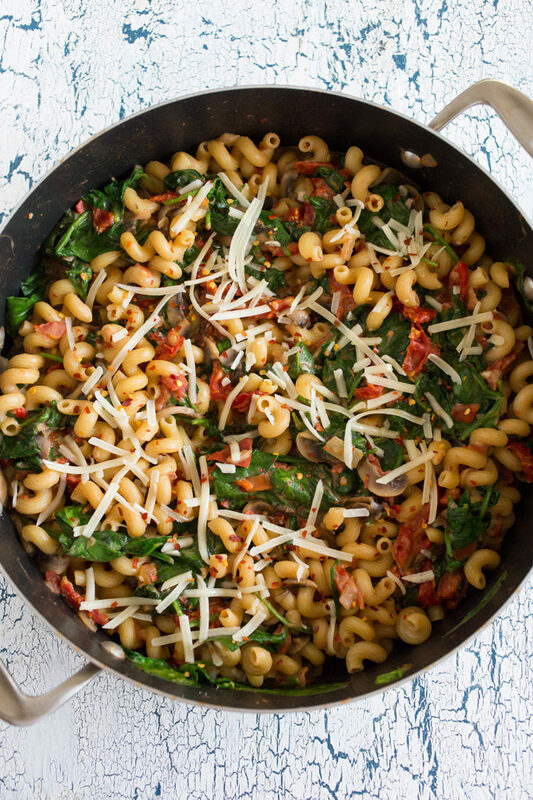 Confession: When the whole “one pot” pasta thing came to be all the rage I hated it. The thought of cooking pasta in the same pan where I made sauce totally freaked me out. I was worried the sauce would taste too starchy or the pasta wouldn’t cook right and it would turn out either gummy or too soggy. One pot people. 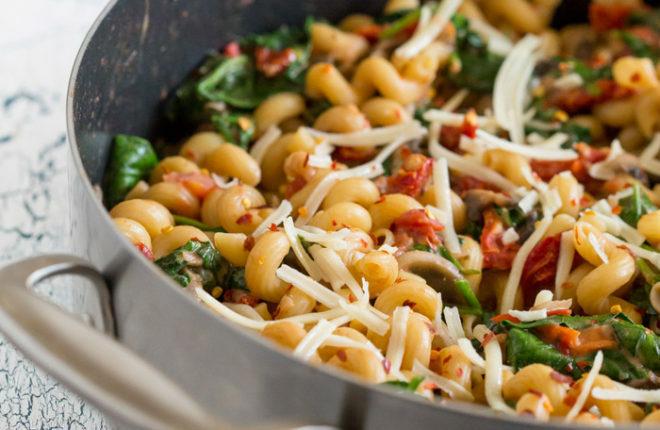 One pot is all you have to wash after you make this dish. The noodles cook up totally fine – I was crazy for thinking they wouldn’t. It’s crazy easy and no one wants to spend hours cooking on a weeknight. 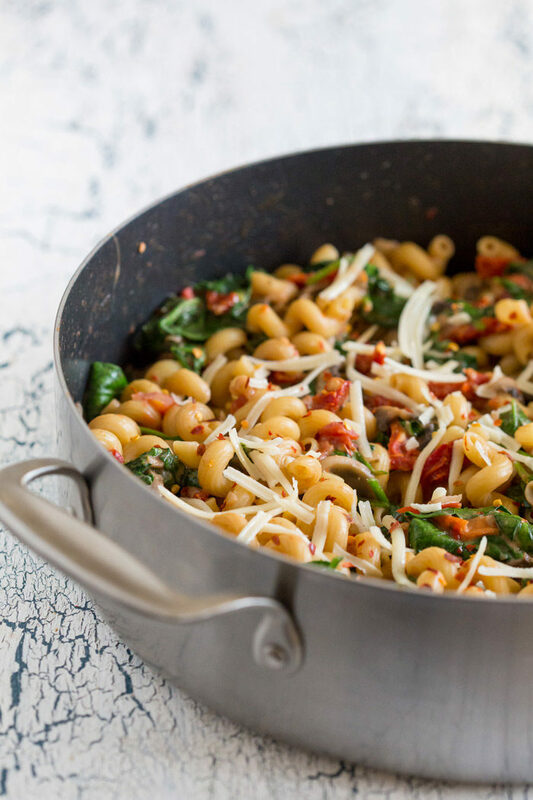 This One-Pot Cheesy Pasta Florentine is PACKED full of baby spinach, tomatoes, sharp Asiago cheese and just a touch of cream. Sometimes when you see creamy one pot dishes they are packed full of cheese and tons of cream. While I don’t mind a little (there is something to be said for deliciously creamy pasta) cream I don’t need my pasta swimming in heavy cream. Am I right? Now, I made this version meat free BUT all you have to do is grill up some chicken and toss it in for the meat-eaters. I have also been known to buy a rotisserie chicken and pick off the meat for my pasta. It’s a total time saver. Also, I added TONS of spinach to this pasta but feel free to balance your spinach addition based on your love (or not love) of that delicious green vegetable. 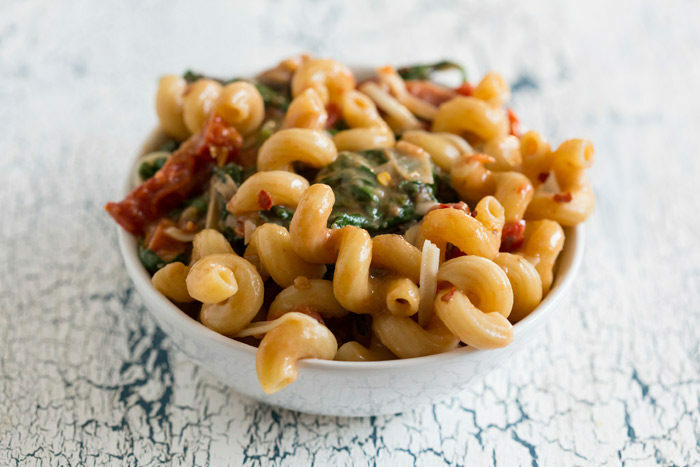 I have also used baby kale in this dish before too and it was totally delicious! Oh and don’t get hung up on what pasta to use. I honestly like to use whatever tube shaped pasta I have sitting in my pantry. 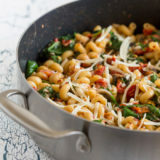 No need to make special trips for special pasta unless of course you are like me and have an undying love for cavatappi. I know, can’t stop/won’t stop about my love of all cavatappi shaped pasta. In a large high-sided skillet add olive oil and set over medium high heat. Once the oil is hot, add in the onion and sauté until translucent. Add in the garlic and sauté for 30 seconds more. Add in the pasta, vegetable stock and tomatoes. Stir to combine, cover and let simmer, stirring occasionally, for about 12 minutes or until the pasta is tender. If the pan seems to be a little dry simply add a little more vegetable stock. Once the pasta is fully cooked, add in the shredded cheese, baby spinach and half and half. Mix to combine and let the heat of the pasta wilt the baby spinach. Top servings with additional shredded cheese and crushed red pepper. Note: If the sauce is too thick, add a bit more half and half. If the sauce is too thin, let it simmer just a few minutes to thicken up. Top each serving with a grilled and sliced chicken breast. You can also cut up a bit of store-bought rotisserie chicken and stir it in to the carnivores’ servings. All images and text ©Brandy for Kitchen Treaty. The blogger behind Nutmeg Nanny, Brandy loves delicious food, bourbon, traveling, and her cats. She serves her food with a side of sass and sarcasm. Brandy is originally from Ohio but is now living life in upstate New York. Excellent recipe, will definitely make again! This was delicious. Easy. Quick . Filling. Yum. A ‘fantabulous’ dish! I’ll definitely be making this often. Everyone loved it, and they’re asking for it again. Thank you! I made One Pot Pasta Florentine tonight. It was delicious and I will make it again. It was very easy to prepare. I did make a few changes. I used three cloves of garlic because there is no such thing as too much garlic. Instead of vegetable stock, I went with chicken broth to add a little more flavor to the dish. I also seasoned the onion and garlic with salt and pepper as it cooked. Instead of half and half or milk I went with heavy cream. Not only is this dish easy to prepare, but it looks magazine perfect when you are done making it. Thanks for the recipe. I’m so glad you liked it! Thank you, Lynn! I made this last night and it was a hit in my house! I’m game for anything in one pot since I’m not the best multi-task/pot cooker…. I agree with the extra garlic, it did need just a bit more. I may tone it down a bit on the onions next time, but I think the above suggestion with pepper and salt while cooking would be very helpful. The 1/8 tsp of red pepper in the pot really made a difference and gave it just a little bit of heat (I’m a baby when it comes to spicy but my boyfriend is a siracha-holic). I wish I chopped up some of my baby spinach, with the cheese the spinach really liked clinging to itself but this may be inevitable. Overall it is definitely in my rotation.